The curious tale of ‘Saint’ Brighid (Bride, Brigit etc) of Ireland is one of the most striking examples of the conversion of a Pagan Goddess into a Christian Saint. What is more curious still is the efforts of her early monkish hagiographers to identify her with Mary, mother of Jesus, as ‘Mary of the Gael’ according to one of her medieval hagiographies. 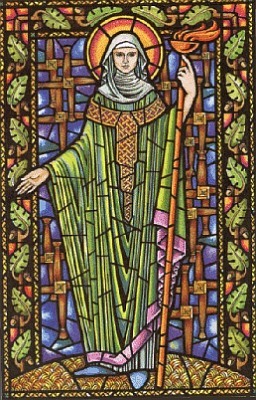 Vita sanctae Brigidae (Bethu Brigte) is the oldest hagiographic Life of Brigid (circa 800CE). In Chapter 11, Brigid is introduced to the assembled saints of Leinster by ‘Bishop Ibor’ who tells them he has had a vision that Brigid is to be the Mary of Ireland. This story is repeated in the later Leabhar Breac account of her life. Brighid herself was undoubtedly originally a pagan goddess looking for a Christian identity, and it is possible that giving her the well-understood mantle of the christian Mary provided this identity. However, the names of the Gallician and Basque ‘fairy’ goddesses – Moura and Mari – force us to consider the question of identity in greater depth. For starters, it is unlikely that these Hispanic pagan ‘Maries’ were named after the Christian character. In which case, we have to speculate which pagan Irish character was the ‘Mary’ that Saint Brighid was to replace? From the pagan-flavoured Irish legends left to us by monks, one possible character comes to mind – the magical female referred to by a number of names, including Morrígan, Mórrígan and Morrígu, also in the plural as Morrígna. Boundary Fairies, Cliff Fairies, Peter and Paul. Curious indeed! The Manx word Moiraghyn is almost exactly like Morrígan – its meaning is can be interpreted as a plural of Mary (‘Maries’) but it also means ‘Mothers’ in its own right, and more importantly the word Muiraghan is given in John Kelly’s 19thC Manx Dictionary as a word for Mermaid. The reference to ‘Kemy’ and ‘Cughty’ is to ‘Keymagh’ and ‘Cughtagh’ – these are Manx terms for local types of spirits, and I have translated these as best I can given current evidence. Kelly’s dictionary has this translation for Cughtagh: “Cughtagh s. pl Cughtee – a fairy, a sprite, a spirit of the houghs; some say ny keymee as ny cughtee…”. He also gives the related word Guight to mean the same. This is evidently the same word as the English/Germanic word ‘Wight’ (from OE/OHG wiht), meaning a sentient being – the Manx, like the Irish, typically added a guttural sound to words beginning with ‘W’. A Keymagh was a spirit believed to haunt the styles and boundaries of churchyards – possibly the same as the revenant of the last-buried who guarded the same in Scottish and Hebridean folklore. The name itself (allowing for m-w sound transformation) would be pronounced the same as the Scots Gaelic Ciuthach (‘kewach’) – a spirit that lived within rocks. It is therefore also possibly cognate with the Breton death spirit Ankou. The charm provides a fascinating insight into the persistence of pagan ideas in a syncretic form with christianity, as well as giving a new insight into the possible identity of the Morrígan of Irish myth. All this might be a bit much to take in, but it is only a small part of the picture of these ‘Pagan Maries’ of the Celtic world… Loch Maree (traditionally linked in Christian history to a saint called Máel Ruba) in Wester Ross in the NW Scottish Highlands is associated with a late description (recorded in the records of the Presbytery of Dingwall from 1695) of the apparently pagan sacrifice of cattle to a god called ‘Mourie’ on one of its islands. The town of Tobermory on Mull takes its name from the Gaelic for ‘Mory’s Well’, there being no Christian history of a well dedicated to the Christian Mary! Carmichael notes some Gaelic names for the month of May in Carmina Gaedelica Volume 2 as ‘mi Moire‘, ‘mios Moire‘ (‘month of Mary’) and ‘Bochuin Moire’ (‘Swelling of Mary’) suggesting a connection between the month of exploding fecundity and ‘Mary’. The pagan goddess was, after all, a representation of the year and her different aspects (and names) represented the seasons. Port St Mary in the Isle of Man was and is known to locals as ‘Purt le Murra’. There is a place near it on Meayll (Mull) Hill called Lag ny mBoire, pronounced ‘Lag na Murra’, suggesting a possible link between the names Beara/Berry (ie – the Cailleach) and ‘Mary’. The question as to the meaning of Mourie, Murra, Mary, Mari, Moura or whatever the original derivation is now arises. There are several possibilities: The first (most likely) is that the word derives from the Latin word for the sea: Mare and its various regional derivations, such as the Germanic Mere, Irish Muir, Welsh Môr, Manx Muir and Moor etc. This is quite in line with the doctrines of the Atlantic Religion I have so far been discussing. The second (less likely) is the Celtic word for ‘big’ – Mór – although the fact that the vastest thing in the experience of Atlantic peoples has always been the sea itself must at least be considered in passing. The Irish version of ‘Mary’ is ‘Muire’. As already mentioned, there is a possibility that there has been a linguistic mutation involving the labial sounds ‘M’ and ‘B’ meaning that the name of the Cailleach – Beara – was originally mBeara – ‘Meara’ or ‘Murra’. A fourth derivation might be from the Greek Moirae, or Fates. A fifth might be the Germanic ‘Mara’ – a spirit that caused nightmares, and from which we derive that word.